It was in Soho, New York, when I first tried this artichoke and spinach dip. It was called Freemans restaurant in one of the small alleyways, a very hidden place. A couple of friends recommended that place so we decided to go for lunch after hours of shopping in Soho. We ordered the dip for entrée to share and thought it would be just an ordinary dip with some bread. But oh my goodness gracious is it amazing! It has become one of my favourite dishes. When it just comes out of the oven hot and steamy, it smells and tastes incredible. Other recipes include sour cream, mayo or oil which I’m sure will add more creaminess to it. But I kept it healthy and simple. 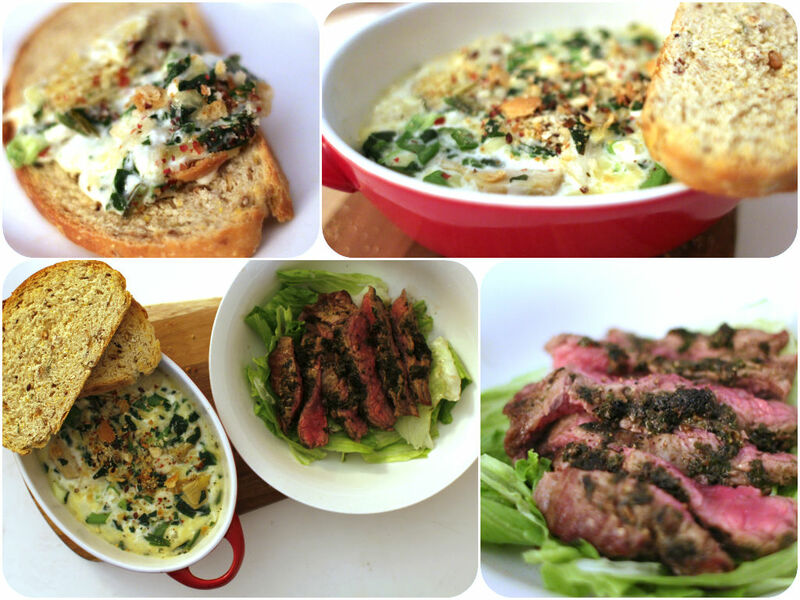 I served with seared steak on the side for Daniel, but you can add protein in a baking dish. Put seared chicken breast and pour this dip mixture all over. Bake in the oven for 20 minutes. Fish or pasta will work well too. It is delish! Mix all ingredients in a large bowl, stir well to combine and transfer to a baking dish. You can sprinkle more cheese on top here. Cook in the preheated oven (180) for 20-30 minutes until bubbly and brown on top. Serve hot with toasted bread or pita chips.